Directions: To comply with the contest, this URL should provide directions. Unfortunately, I don't know how to get to Upper Caney Creek falls. We had a hiking guide take us to multiple falls in the Sipsey Wilderness in Bankhead National Forest in Alabama. We drove three hours to meet our guide so the area was unknown to me. Three photographers from Montgomery decided we want to take pictures of waterfalls. 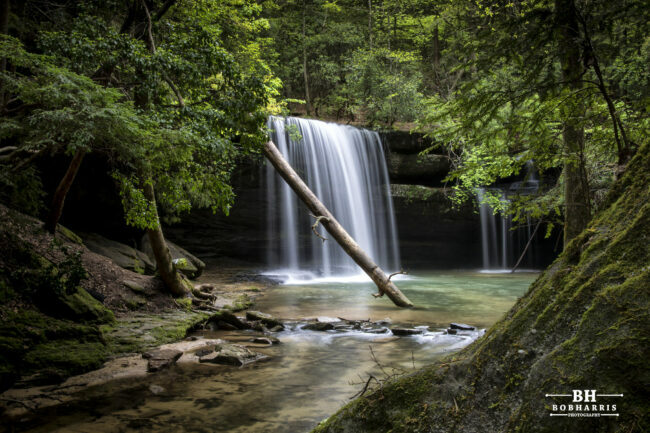 A quick Google search for ‘falls in Alabama’ resulted in many recommendations to visit the Sipsey Wilderness in Northwest Alabama – a three hour one way drive for us. A member of our group contacted the local hiking club and a volunteer took us out for two days photographing many falls. Each fall was more spectacular than the previous! In our day and half journey, we only photographed six falls. Caney Creek falls appears to be small, but the volume of water cascading down makes a loud noise! Our hiking guide strongly recommended visiting Sipsey Wilderness between the fall and spring since most venomous snakes are dormant during this period. When we visited in March, our guide spotted a large copperhead directly in the path and well hidden. We could have easily been bitten. Caney Creek was a comfortable hike ~ about a mile on an improved trail. The trail became rather steep the last 500 yards. Unfortunately, we were unable to visit at an idea time for lighting. So we attempted to make lemonade with what we had. We’re going back this fall and staying overnight in the wilderness! It was that good! Tips: use a tripod. If you have filters, use them. Best time to shoot – early morning/late afternoon. Wear hiking shoes, bring snacks, bring your camera!